The kids haven't been cooking too much lately - these long, hot days seem to sap their motivation. All Alexander cares about it ice cream, although he had a molar pulled yesterday so I can understand that! 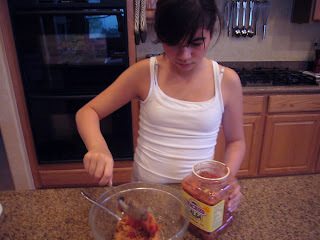 However, Sabrina made Mexican dip last night, a super simple recipe that I made up several years ago. It's so easy, and everyone loves it! 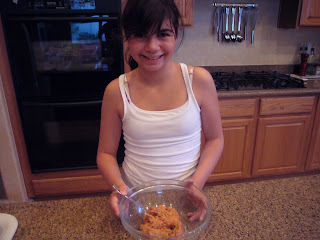 First, empty one can of refried beans into a bowl. Mash them up really well. 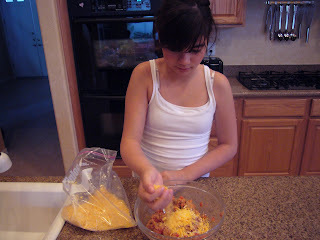 Then, add in 1/2 to 3/4 cup shredded cheese. We buy the cheddar/monterey jack blend from Costco. 1. Microwave it for 2-3 minutes, or until bubbling and hot. 3. 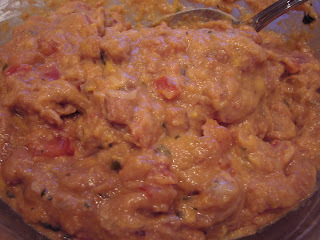 Pour it into a slow cooker (this works best when you are doubling or tripling the recipe) and cook on high for 3-4 hours.